You will hopefully recall the recent story we did on Darden, parent company of the Olive Garden restaurant chain, sending a legal threat letter to the man behind allofgarden.com, a site that reviews Olive Garden dishes, because the internet is a strange, strange place. At issues, according to the threat letter, was that allofgarden.com named Olive Garden in metatags in its reviews of the dishes, which you should already know is nothing remotely resembling trademark infringement or infringement upon any other types of intellectual property, either. With that in mind, Vincent Malone replied to the threat letter in a manner both well-informed of his own rights and one which demonstrated just how funny Malone is. After refusing to comply with the requests in the letter, he demanded a reply within nine days in limerick form. His demands were not met exactly, but Darden has now responded to Malone, apologizing for the letter, promising no further action would be taken against him, blaming an IP enforcement bot for the letter, and sending him a $50 gift card. Sadly, none of this was delivered in the limerick form Malone had requested. As apologies for this sort of thing go, this one is pretty good. It was apparently in further conversations outside of this letter that Malone was told of the bot, which may well be true but only demonstrates that too many companies play loose with the way they seek to enforce their rights. This story ends on a positive note only because Malone decided not to immediately back down out of fear of a much larger company, after all. It doesn't take too much imagination to suppose that there could be, or perhaps have been, instances we don't know about in which sites simply comply with these unreasonable demands instead of seeking limerick apologies as Malone had. But if you thought I was going to leave you having read this post without a limerick to read, I can allay those concerns, as Malone himself decided to inform his readers of all of this in poetic form. When all else fails, blame the IT guys. There seriously needs to be penalties for sending bogus IP things, its the only way these companies will get better. I've seen this conclusion several times, and I'm disappointed every avenue ignored the white elephant in the room: the phrase "as long as you continue to respect our brand". A company has no (legal) right to demand how anyone should address their "brand". At least he's not going to court. I think that's shorthand for "respect our brand rights," ie. not committing actual trademark infringement. Which is a lot more reasonable than the literal reading. Writing is about clarity; if they want the meaning of the phrase “respect our brand” to be construed as “respect our brand rights”, they can just say “respect our brand rights”. How much trouble would adding an extra six-letter word and clearing up any possible confusion really cause in this situation? About 7 characters worth of trouble. As if he is suddenly going to run out and open another restaurant chain called The Olive Garden. If legal was in the huddle and made "them" add that phrase, then they certainly should have done a better job of phrasing it if they meant something other than what it sounds like. Or maybe they simply wanted a stereotypical Italian mobster flavor added. You know, for authentic-ness. Especially since that part was ostensibly inserted by the d-bags in legal. Did Darden say they were going to stop using these IP bots? If not, then the issue it's settled. Although the situation worked out fine for this guy, I can easily see this happening again. In fact, I'd be willing to bet that an IP bot will send a notice to TechDirt for daring to mention Olive Garden (or olivegarden) in an article talking about Olive Garden. The first rule of Olive Garden is: You do not talk about Olive Garden. The second rule of Olive Garden is: You do not talk about Olive Garden. Third rule of Olive Garden: Someone yells "stop", goes limp, taps out, the Never Ending Pasta Bowl is over. Are you liable for things your bot says and/or does? Since it's a bot what would have happened if he NEVER RESPONDED? I mean, you can't prove someone read your email. Is email even considered "Good faith" as to a means of communication? Send me a registered letter. Is no one else wondering about Branden? He is now completely silent on this and that worries me. Did they fire him? Transfer him to Janitorial? Has he been kidnapped and sold to slavers in Southeast Asia never to be heard from again, his family left to wonder why he never came home, little Susie Forcements left to grow up without a father? What have you done with Branden, Darden? Oh boy. I suspect Mr. Branden is... sleeping with the fishes. Capisce? The Forcements family may be in a pinch! This just tells us that the IP bots aren't supervised. Whenever a /hit/ is generated there is no human verification. Same on the GrapeField for being so lazy. That'll make everything right... Kinda restores my faith in mankind. Maybe if it was a $50 gift certificate to TGI Friday's. To file a valid DMCA takedown, you must state under penalty of perjury that you own the copyright in question and that you believe in good faith that the violate is not fair use. But a bot cannot do those things. A video is not court-admissible evidence because the rules of evidence predate the invention of video cameras -- a video is only admitted as evidence if a living human being watches it and then testifies about what the video shows, which can lead to absurd results if the person testilies instead. So, how exactly can a bot make a legally admissible statement, as required by a DMCA takedown? I honestly don't see how it possibly could. Ah, the good ol' corporate equivalent of the "but my dog ate my homework" excuse. More like the police equivalent of, "I say so 'cuz my dog said so." While it's good that they backed down and apologized and all, I'm not buying the bot bit. Alofgarden doesn't seem close enough to Olive Garden for that. 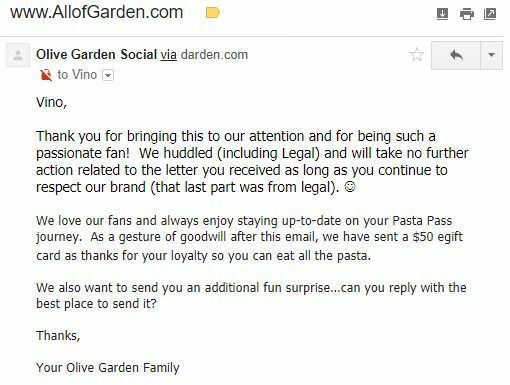 If it were, Olive Garden would be sending threat letters to half the garden supply places in America, and I don't see that happening. Branden Forcements is a robot??? I'm shocked, shocked!! It sounds like it could have been a limerick but someone (legal?) changed it? And being such a passionate fan. "Much useful information for beginners Those who want to build a new garden or want a new garden, will benefit greatly by reading this article. I have read the post with great attention and have benefited a lot. I have kept a lot of notes. you can visit this link for hedge trimmer- http://www.hedgetrimmerinfo.com/ Thank you very much for your great effort!" What is Blames IP Enforcement Bot where can I get information? I have to Write My Dissertation UK for Blames IP Enforcement Bot and I am looking a good website to share complete information.